Today I made my television debut, though not under the circumstances I would have wanted. Ideally, I would have been asked to be in Doctor Who, as a scheming villain with an evil laugh. But that didn’t happen. Instead, I contributed to Channel 4’s 4thought series, after the news at 7:55. You can catch up with it at 4thought.tv, and also read what other viewers thought of what I said. I’m mainly relieved that I didn’t make an eejit of myself, and the producers didn’t make an eejit of me either. It says pretty much what I wanted it to say, so that’s good, and I’m enormously relieved. But alongside the continuing tragedy in Japan, there was another tragedy closer to home, as I attended the funeral today of my 19 year old next door neighbour. He died in a motorbike accident on Saturday night, and needless to say, the family are devastated. I guess the same thoughts apply to that situation as to the tsunami victims. But on a brighter note, I finally saw an episode of Jamie’s Dream School tonight (also on Channel 4, and no I don’t have a sponsorship deal). It was on in the gym when I started on the running machine. I ended up running over 4 miles just to keep watching it! I’ve had arguments about this one, where my friend makes the reasonable point that they aren’t actual teachers, and they’re not actually teaching them very much, and that real life is complicated and quick fixes seldom work. But watching it tonight, there are some kids who are starting to make decisions about who and what they want to be, and I hope it works out for them. I caught up on some tv tonight. The highlight of the 10 o’clock show from last week (warning – as usual it’s a bit sweary, but also contains some really good analysis of the week’s news) must be Charlie Brookers statement that “Nuclear Physics is being explained to me by people who struggled to describe the colour of Kate Middleton’s dress last week”. Yes, I know, I’m still focusing on Japanese stuff. But it’s perfectly normal; it’s still kind of on my mind a bit. I can’t resist drawing attention to another article in the Register which is not so much about the actual problems at Fukushima, but more about the media reporting of it. Having sat in Tokyo for a week and seen some of the hysterical scaremongering that terrified my family, while governmental and other experts told us that we would be fine, I like this. The media has an agenda these days, and it is seldom to provide comfort or reassurance. Of course, the Register has an agenda too (they seldom say anything nice about my company), but I think they are more right than wrong on this. Oh, and if anyone is interested, my slot on 4thought on Channel 4 will be on Wednesday evening, at 7:55. Just read this article in The Register, which tries to put some of the ongoing reporting of the issues at the Fukushima nuclear reactors in context. Thankfully, it is quite reassuring. I had assumed that once I got back home from Japan, life would quickly return to normal, and I would no longer be of any interest to the media. But I turned out to be wrong, as Channel 4 were in touch the day I got home, asking me if I would be interested in contributing to their 4Thought series. These are the very short programmes that come on after the news on Channel 4, that cover moral, ethical or spiritual subjects. Starting tomorrow (28th March), they are doing a week of programmes about the Japanese earthquake and tsunami. I really wasn’t sure about this, but when their interviewer called me up and talked to me about it, they seemed very keen to have me. It turns out that they wanted to have a spectrum of views, across various religions and backgrounds, and it would seem that I am the representative of Christianity. I’m sure there must be someone better qualified than me, but I guess I have an interesting story for the tv. Anyway, off I went to London on Thursday, to record my bit. We talked for something approaching an hour, and the finished programme will be no more than 2 minutes, so there’s a lot of cutting involved! I can’t say I am looking forward to seeing the results – I just hope I didn’t make an eejit of myself, and that I made a reasonable case for my faith. Needless to say, in the face of a tragedy like this, there are no easy answers. As yesterday’s post said, my journey home turned out to be more difficult than I had expected. Our reasoning turned out to be correct – Virgin had indeed sent their flight crew to Nagoya rather than keep them in Tokyo. The flight out of Tokyo was not very busy – there were lots of empty seats on the plane (despite press reports of people fleeing) and once everyone was on board, I was able to move up and take a seat at the exit, with lots of lovely legroom. A Japanese gentleman did the same. He was a former reporter with very good English (and fond memories of Ireland), so we chatted for a while. He couldn’t believe my earthquake story of being up Tokyo Tower. And I couldn’t believe his earthquake story either. I’m sure he won’t mind if I repeat it here. When he retired, he bought a boat to sail around the world single-handed, which he did. He was still living on that boat, as he hadn’t been able to sell it since his voyage. He was at a shop when the quake hit, and took cover out the back in a garden where there weren’t electric wires to come down (a danger I hadn’t considered, but one that must be significant when you look at the power cables strung along each street in Tokyo). When the shaking stopped, he raced off to make sure his boat was okay in the tsunami he now expected. The first wave of the tsunami broke 4 of the 5 mooring ropes, leaving him with just one, but his boat was still intact. He left the boat again to seek help getting it secured when someone pointed behind him to where the second wave was coming. He saw his boat go into the air, and come down, and break. At that, he ran for higher ground. He spent a few days in a refugee centre, but not unsurprisingly it was pretty depressing, so he headed for his brother’s in Tokyo by train. He made it most of the way (including detours through the Fukushima exclusion zone), but once he got to Tokyo the trains weren’t running for him to get all the way, so his brother had to come and get him in his car. With the petrol shortages, they weren’t sure they’d make it back, but they did. He then headed for the airport, and booked a flight to London, where I think he has family. His boat wasn’t insured (apparently you can’t for round the world trips at his age), so this is a man who I guess has lost everything he had. It made me realise that everyone on that plane must have had their own earthquake story, of where they had been, and what had happened. A sobering thought. But I wish that guy well for the future. Got up bright and early this morning for the journey home. Well, early anyway – I’m not a morning person. We headed out earlier than usual, as our preferred train to the Airport (the Keisei Skyliner) wasn’t allowing advance bookings (which it usually does), and therefore we worried that the trains might be running full, and we’d not be able to get to the airport on time. It wasn’t full – I thought it was pretty quiet. So we got to the airport early, worried that it would be very busy. It isn’t especially busy. But everyone else was there early too, and none of the check-in desks were open (we were just a shade over 3 hours before the takeoff time, so I guess that’s not unreasonable), so there were lines. We went and had a second breakfast, and then came back when check-in had opened. On checking in I was given a letter to say that the flight was diverting to Nagoya, which is an hour away, and stopping there for an hour to change crew. So my flight which had been due to arrive at 3:30 pm in London is now expected to arrive at 9:30 pm. Where’d the rest of the delay come from? We’re also taking off nearly 3 hours late. Karen’s never seen delays like this out of Narita Airport. The theory is that there is a relief crew in here in Japan, but instead of staying in Tokyo ready to take over, they were shipped out to Nagoya. Because flying regulations are very strict, it’s probable that the current crew can’t just fly us to Nagoya in our scheduled slot, as they just flew all the way here from London, and need to take a break. So anyways, I’ve just spent the last while at a free wi-fi point re-booking my Belfast flight, and booking myself into a cheap hotel at Heathrow. Thank goodness for wifi and netbooks at airports – this is much easier than it might have been, since it’s after 2:00 in the morning in the UK. And how is the airport? It’s not particularly busy. Karen reckons that the demographics of the travellers has changed, as there are more families with children and fewer businessmenthan usual, since this is during the school term, and you’d seldom see children here. But it’s certainly not chaotic, or especially jam-packed with people. Right. I’m off to wander round the airport and look at stuff for a while before I settle down with a book. Yesterday we went out and did normal stuff! We went on the train to Akihabara, did some karaoke, ate dinner out, looked at the flashy mobile phones, and bought some doughnuts to bring home. This is the kind of thing I’d been expecting to do lots of on holiday! It was all very normal and sensible, except for the earthquake during dinner, where the entire restaurant shook, and we got to watch all the frying pans swinging in the kitchen. It was nice to be out and about again, and do normal stuff. After speaking to my dad yesterday, and continuing to get messages from people asking why I wasn’t coming home, I decided to talk to Virgin Atlantic yesterday. Previously, I had only looked at their web page, because I wasn’t seriously looking at changing my flight, and it had shown that my flight was not changeable, and I’d have to book a new one for over £2000. However, when I spoke to an actual human being, and told her I was in Tokyo, she was able to help me, and offer me a flight for Monday at no additional cost. They couldn’t sort out my Belfast connection, but I was able to do that myself. So in the end, better marks for Virgin Atlantic, who were helpful after all. On to the next question – why am I going home early? I am not leaving because I feel I am in danger from radiation. I am not leaving because I am suffering in the aftermath of the quake. I am going home because my family are worried about me, and it’s probably selfish for me to stay any longer than I have to. Added to that, it is my mum’s birthday on Wednesday, and being home for her birthday seems like a really good idea, under the circumstances. I do feel bad for leaving early. It’s another person leaving Tokyo, which starts to make the tabloid frenzy about people fleeing Tokyo look correct. But I’m also only one person, and I’m only leaving 2 days early. And let’s face it, I’m not helping anyone by being here, but it might help people if I go home. 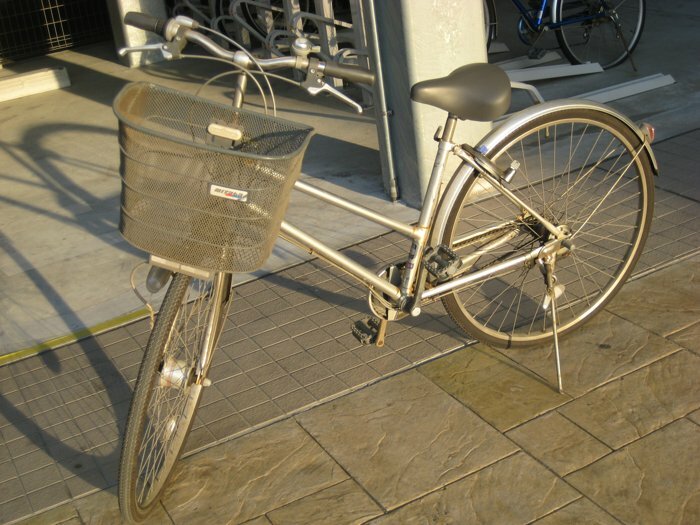 I went out for a cycle today, on what is presumably a fairly typical Japanese city bike. It was interesting. Yes, it has a basket on the front, and it’s not what I am used to riding. But just bear with me – it has some interesting features. 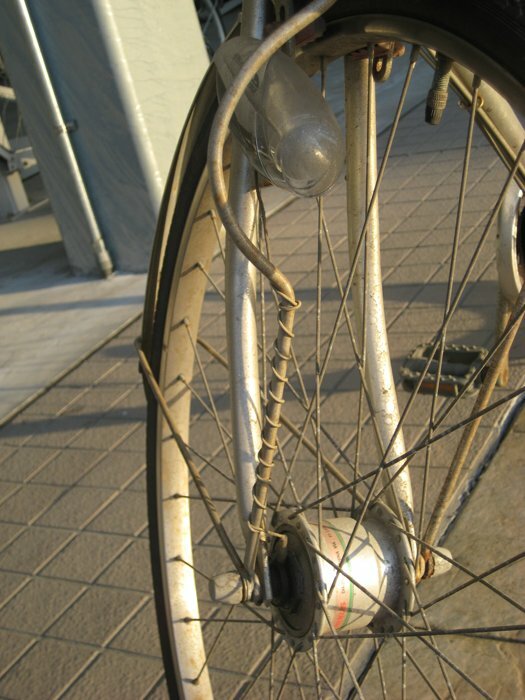 The enlarged hub in the front wheel obviously contains some kind of dynamo, which is wired to the light. So as soon as you start peddling in the shady garage, the light starts flashing. It’s a nice feature. I’m not sure if the light continued to flash when we were outside in the sun or not. But it’s still nice. This is the back wheel. 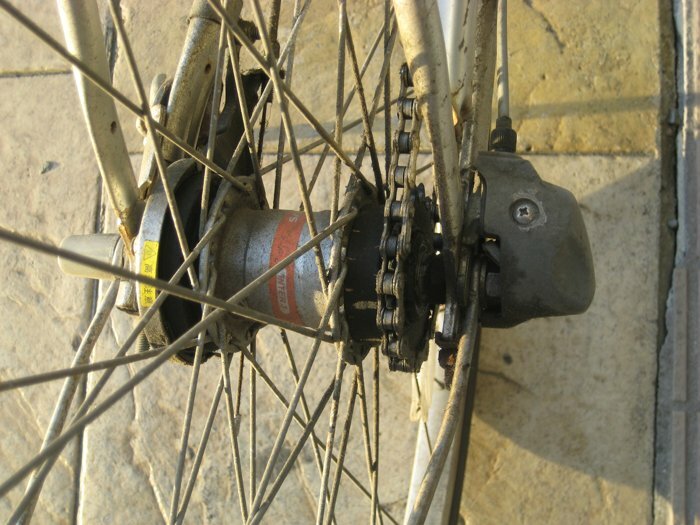 Again, there is an enlarged hub. Again, there’s something clever going on inside there, as the bike has three gears, but there is only one drive cog, and only one cog here at the back wheel too. So there’s some kind of clever linkage inside the hub between the cog you can see and the wheel. But I have no idea how it works. And this is the built in lock. Just slide the blue lever to lock and unlock, as long as the key is in. 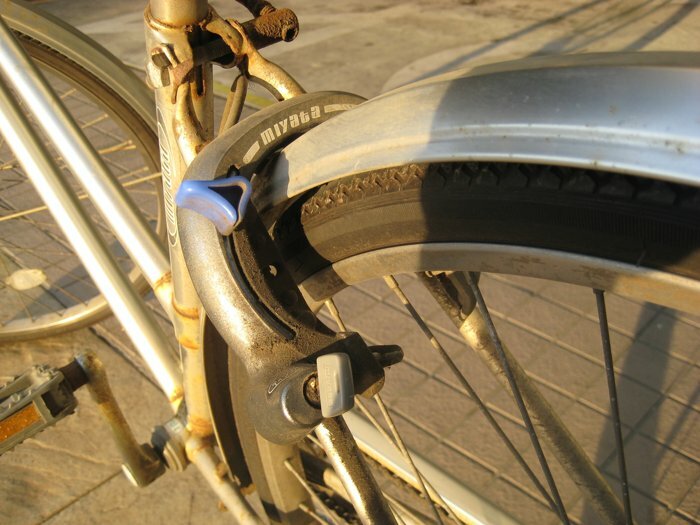 Admittedly, you can’t lock the bike to anything, but the back wheel sure won’t turn. I also discovered there’s a link between this lock and the front wheel, which locks the steering to straight-ahead, or turned, which is pretty clever. The downside to all this trickery (well, apart from the basket, which is a major downer), is that the bike is really heavy. Heavy as if it were made from depleted uranium. But at least it’s got some interesting gadgets. You are currently browsing the Destroy All Onions! blog archives for March, 2011.